Lost under an oversized “Dont Mess with Texas” T-shirt, I sank into our black, P Diddy-esque leather couch. Sundays are the only time I’m quiet , reflective. Recovering from the ravages of Saturday night. Quietly freaking out about looming deadlines. Uncle Roy’s impending charity Indian ball. Christmas. Anything, really. Hubby sits beside me having a crap movie fest, cherishing the rare silence. As my father-in-law tactfully put it, the only time the Basu sisters are quiet is when they are hungry or asleep. How true. For I was craving something super healthy. But, far too fagged out to stir onions. I remembered the banana leaves in the freezer. In a fit of total idiocy, I bought a massive pack when I really needed two leaves. Leaving no room in the drawer for essentials like frozen parathas and ice cream. It was time to put them to good use with macher paturi, fish smothered in mustard, coriander and chilli, wrapped in bamboo leaves and steamed. 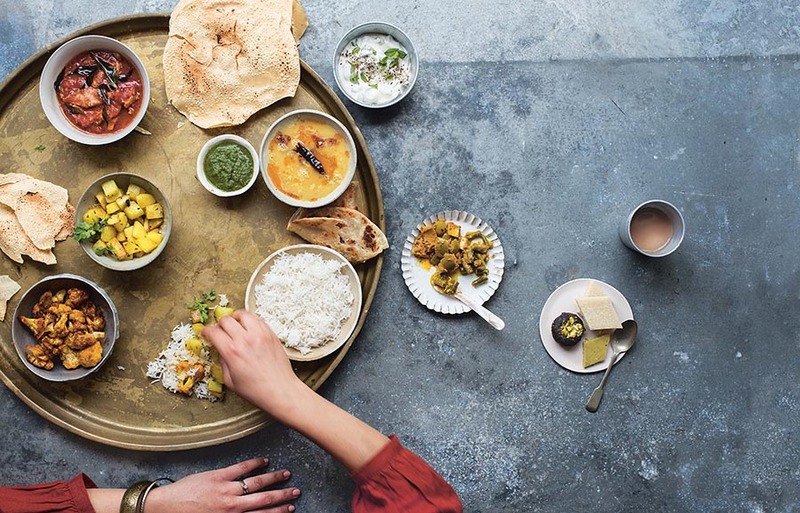 It’s served on special occasions like weddings in West Bengal. Wrenching myself away from the riveting Holloywood blockbuster that is Elektra, I returned 20 minutes later with a full plate and smug smile. I was going to be ready for that deep, meaningful conversation soon. Bring the kettle to boil with two cups of water. In a blender, puree all the ingredients with a teaspoon of water to get a light, grainy paste. Add enough salt to make it a strong marinade. 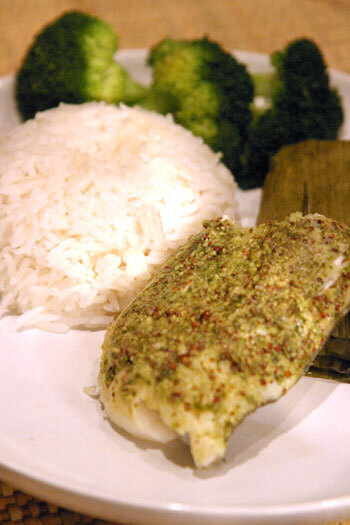 Smother the surface of each cod fillet with this paste and place on a washed banana leaf. Make a parcel, folding the leaf over each fillet evenly. Place in a steamer (I used a covered colander over a pot) and steam for about 12 minutes until the fish is cooked through. I served this with traditional wedding delicacy ghee bhat, 75 gm rice cooked with a teaspoon of ghee and some salt, and steamed broccoli, for no particular reason. A delicious combination. Great recipe with simple and delicious spices. haha, yr post is soooo funny, loved reading through it. U re quiet when u re hungry? Wow! I am pretty obnoxious, running around in a real bi***y mood being leaving sarcastic comments on just about anything… Wouldn’t shut-up until my mouth is full..
At last you made it. Lovely, is whole grain mustard something else ? father in law, basu sisters, amazing eh??? i wonder how they can make out? Its mazing to read your write up with that hearty meal of your!! and btw where did u buy banana leaves??? I can’t find them anywhere in uk?Am i too ignorant? ?do tell me please sweetie!! i bet my husband would wish i was quiet when i’m hungry! ha! i’m awfully cranky and moody and have to neat not in 10 min, not in 5, but now! This has nothing to do with your Macher Paturi on the couch dish but your Bombay Aloo was delicious! Many thanks to little Basu who thought of her fellow workmates before it was spared. Padmaja – any Chinese or Thai food shop has fresh banana leaves. They freeze really well too. I just pick up a pack from Chinatown for Â£1! Sandeepa – it’s French wholegrain mustard. you know me and doing things from scratch!! Is it? I never knew we get them in chinese or thai,guess what i am doing this weekend, with hubby in India for his best friends wedding, i do have time for hunting these leaves down!!!! The fiance mocked me through the entire process. He said I had failed as a Bengali for managing to tear the banana leaf (so I added a double coating). Twelve minutes later, rice and fish in hand, he was surprised. Then he went into food coma. His latest: This website is a revelation! Taking the leftovers for lunch. Work is going to smell like a mustard wonderland tomorrow after I nuke this deliciousness. Used hammour, plentiful in this part of the world, and added a dash of fresh lime juice to the marinade because I was afraid the number of chillies would overwhelm the dish. It worked beautifully.